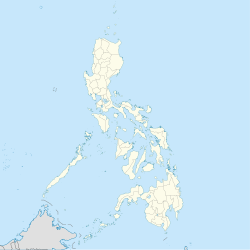 Almeria, officially the Municipality of Almeria, (Waray: Bungto san Almeria; Cebuano: Lungsod sa Almeria; Tagalog: Bayan ng Almeria), is a 5th class municipality in the province of Biliran, Philippines. According to the 2015 census, it has a population of 16,951 people. Almeria is located at 11°37′N 124°23′E﻿ / ﻿11.62°N 124.38°E﻿ / 11.62; 124.38. According to the Philippine Statistics Authority, the municipality has a land area of 57.46 square kilometres (22.19 sq mi)  constituting 10.72% of the 536.01-square-kilometre- (206.95 sq mi) total area of Biliran. Almeria is politically subdivided into 13 barangays. In the 2015 census, Almeria had a population of 16,951. The population density was 300 inhabitants per square kilometre (780/sq mi). ^ a b "Province: Biliran". PSGC Interactive. Quezon City, Philippines: Philippine Statistics Authority. Retrieved 12 November 2016. ^ a b c d e Census of Population (2015). "Region VIII (Eastern Visayas)". Total Population by Province, City, Municipality and Barangay. PSA. Retrieved 20 June 2016. ^ "Municipal: Almeria, Biliran". PSGC Interactive. Quezon City, Philippines: Philippine Statistics Authority. Retrieved 8 January 2016. ^ "Province of Biliran". Municipality Population Data. Local Water Utilities Administration Research Division. Retrieved 17 December 2016.